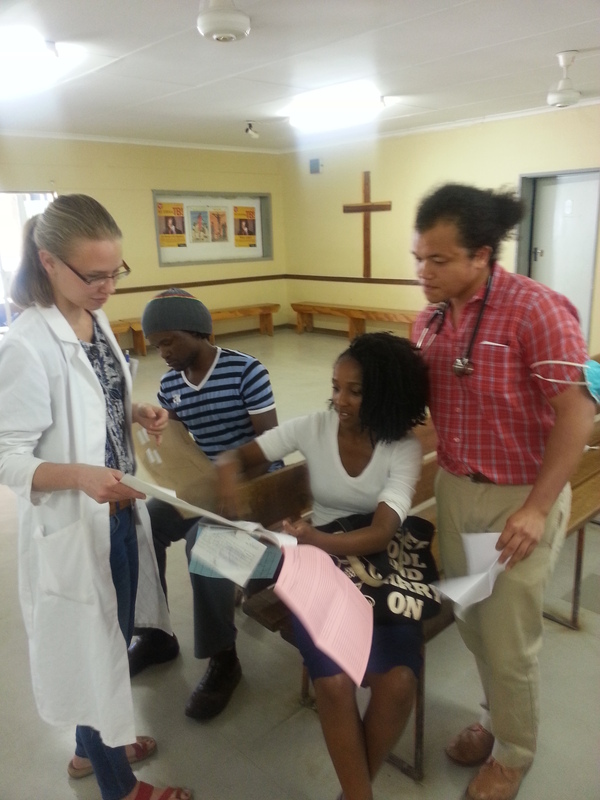 MS4 Anna Jesus shares her experience becoming a mother during medical school. Also check out previous posts from this week written by MS4s, one on Penn Med’s student body, and one on exploring interests in primary care, both locally and globally. The medical school registrar knew I was pregnant before we told family and friends. I was over-the-moon happy and hopeful…but I was also knee-deep in my internal medicine clerkship. I honestly didn’t know how my third-year clerkships would play out with a first-born wedged somewhere in the middle. Within ten minutes of nervously emailing the administration my news, I received a reply with the subject heading “Congratulations! !” The registrar then proceeded to amend my schedule so that I could tackle the most demanding rotations prior to having a dependent. Do not think for a second of keeping this secret. Make your pregnancy known to everyone in the Trauma Bay. Wear two layers of lead. There’s a blue line surrounding each bed that is 6 feet away. Double that distance when an x-ray is called. Don’t forget that we’re a team. We will protect you. I will protect you. Oh, and realize that your life is going to get SO much better. You thought you life was good now; well, it’s going to skyrocket come–when is your kid due? October?! That’s even better. Read Outliers. She’ll be top of her class. He was understating it. Our eldest is only two, so likely too soon to tell regarding her future academic performance. But I can honestly say that life is better than I could have envisioned. I’ve never smiled so much in my life. Encouraged by our experience with number one, we elected to have a second child in med school. There are plenty of days when a shower doesn’t happen or when most of my calories are consumed off the floor, scraps discarded by a fickle toddler and uncoordinated infant. Unlike my personal hygiene, my medical school performance has not regressed. If anything, personal commitment and fulfillment have made my work and studies more efficient, in addition to more joyful. 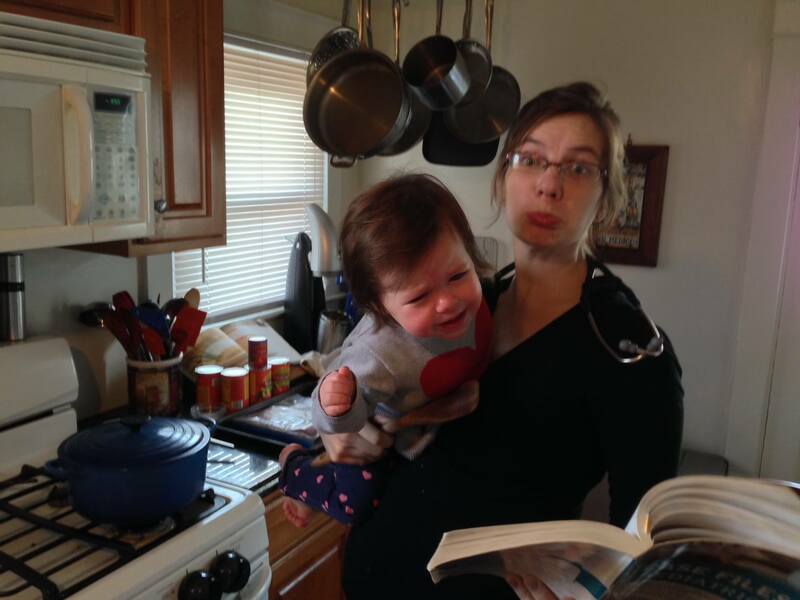 If there had to be a downside, what’s the worst part about parenthood in med school? It’s a tie. 1) Lactation rooms: Though every single person with whom I’ve worked has been supportive, a few affiliate hospitals have less than ideal pumping environments. The experience that takes the cake was having a psychiatric patient walk in on me half-dressed, hunched under rusted sink piping. 2) Med student-itis by proxy: Think med students are hypochondriacs? Mothers are over-protective? Imagine a med student mother who accidentally dropped her 10-month-old head first onto a cement floor, especially after having learned all about traumatic brain injuries… That’s a whole new kind of crazy. But the best part? Loving both your personal and professional life, and believing that your kids will be better for having a mother who is happy and passionate with her career in medicine. Anna Jesus earned her B.A. from the University of Virginia in 2006, her M.A. in English in 2007, then completed her premedical coursework at Goucher College in 2008. 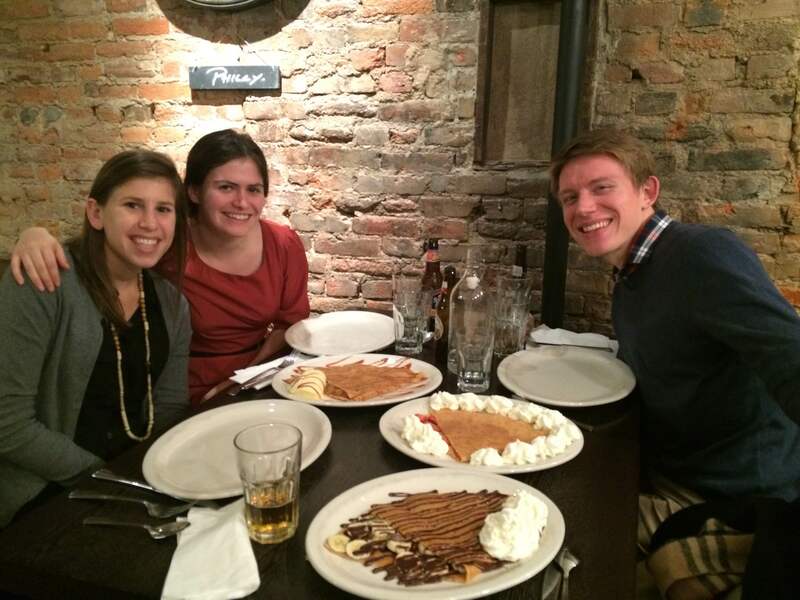 In medical school, Anna incorporated her writing background into the blog Anna In Med School. 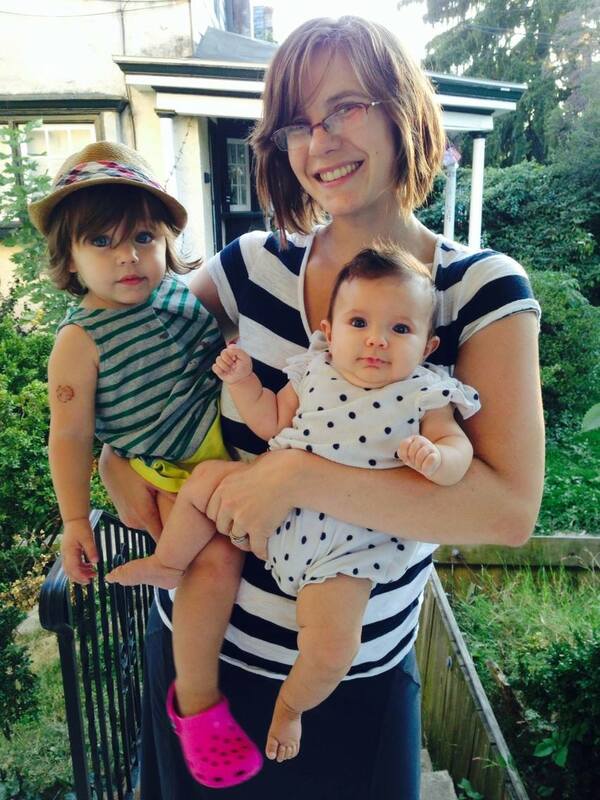 With her husband, she enjoys CrossFit, play cafes, and the trial and (so many) error(s) of parenting. She will be beginning a residency in pediatrics in Summer 2015. Last Friday, March 20th, MS4s and their friends and family gathered in Dunlop Auditorium for the Match ceremony. One by one, students were called up to receive the envelope that would reveal where they matched for residency. To celebrate their amazing accomplishments, this week Penn Med Voices will be publishing pieces written by some awesome MS4s. Intimidating…diverse…loud. These were the first things that came to mind when I was introduced to the student body at our medical school. 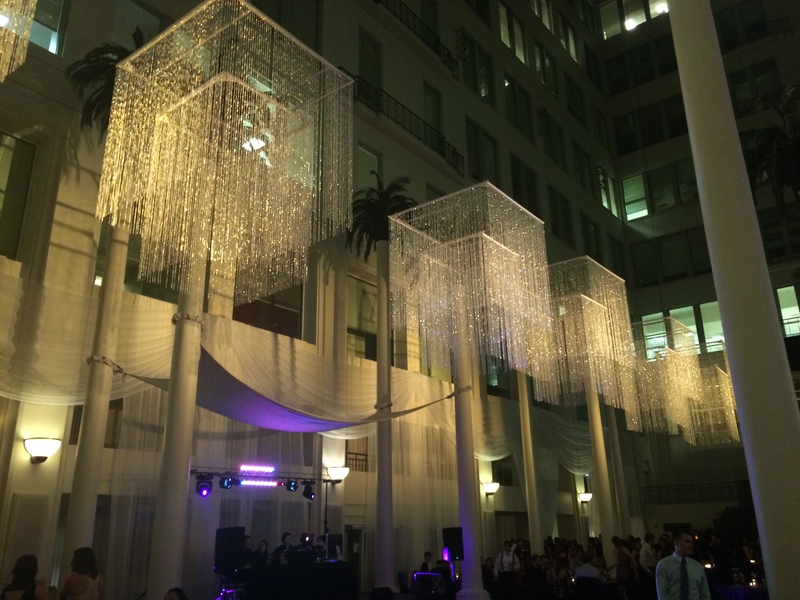 Looking back upon the last 5 years I’ve spent here, I can say my impressions have drastically changed—for the better. Instead of the word intimidation, I should have used future stars, or better yet, leaders. It’s not everyday that a medical student is the centerpiece of a NY Times article about game-changing HIV research. And seeing other classmates with editorials in journals like NEJM and JAMA so frequently, you would’ve thought they had their own editorial column. With diverse, I should elaborate further. In my class, about 42% of people were considered underrepresented minorities—that’s almost half of the class. While this is something that every medical school should strive to achieve, there are so many other ways to be diverse. Age, schooling, political beliefs, etc. 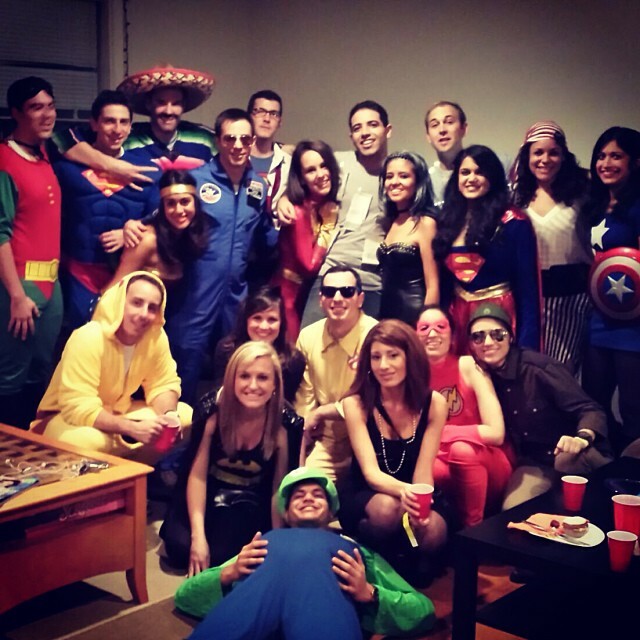 I found I’ve learned the most from my classmates who did not attend an Ivy in the northeast, or from those who have worked in finance or a non-profit during their gap years. I cannot overstate how much I have learned from them, how much they have shaped me into a better doctor, and more importantly, a better human being. Loud—I was right on the money with that one. 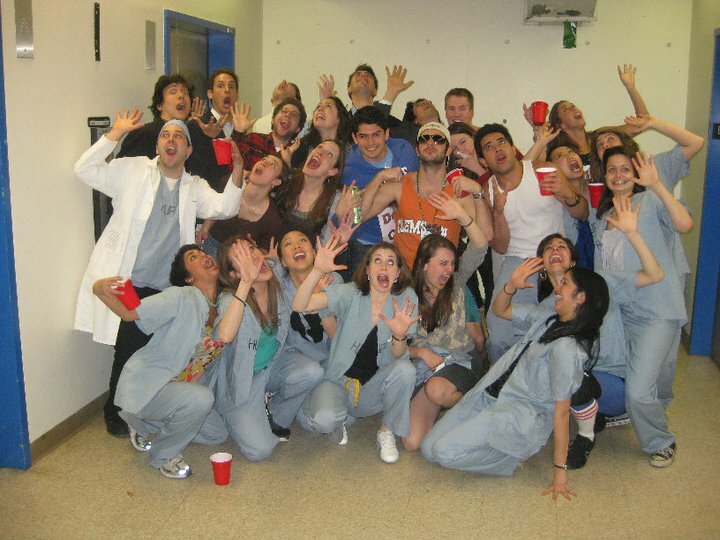 Think back to all the fun and crazy times during your college’s “new student orientation” week. 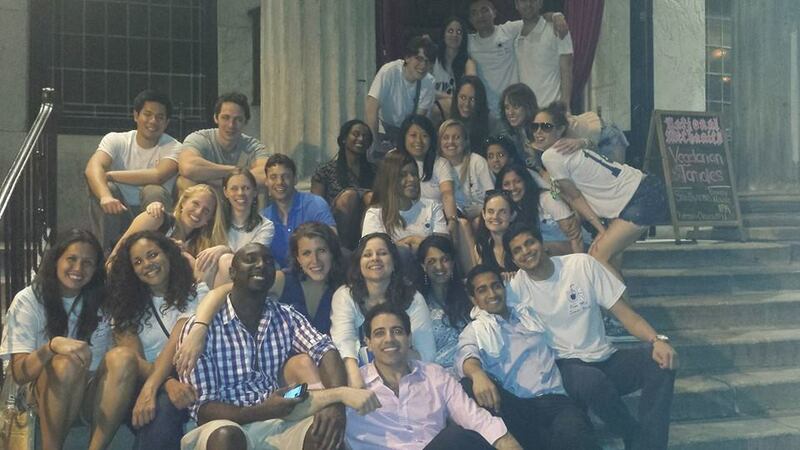 I would say my med school class continued our new student orientation week for all 4 years. There was always a pregame going on somewhere, a dance party downtown, or an intramural team to join. The best part about our social life was that it was social. We didn’t talk about school or work. We really got to know one another as friends. And this word—friends, or more accurately, lifelong friends, is what I really want to impress upon you, the future medical student at XXXX Medical School. When I was starting my second away rotation last fall, which was also my 3rd “audition” rotation in a 3rd new city back-to-back, I needed a break. (By the way, away rotations are month-long sub-internships at other programs that are required for more competitive specialties. They’re seen as a 24/7 interview for the month and they basically make-or-break your chances of matching.) So at that point, all I wanted was to sleep in my bed and know where I could go to do my laundry. That didn’t happen. But when I saw who the intern was at the beginning of the month, I knew then that I had caught a huge break. You see, I took a year off for research, watching my classmates graduate and become doctors in the meantime. So when I found out my intern for the month was one of my best friends from school, I was overjoyed. He let me in on all the little things that would expected from me, showed me where everything in the hospital was, and put me in the best position to succeed. More importantly, he became my biggest advocate. The comforting thing is that I know any of my schoolmates would have done exactly the same as this intern. And that is truly rare in today’s world. I can’t overstate the incredible impact my classmates have had on me and how they’ve changed the way I approach both work and life away from the wards. For that, I will forever be grateful. Marten Basta is a graduating MS4 pursuing a career in Plastic & Reconstructive Surgery, originally from small town Georgia. He graduated from the College at Penn in 2009, majoring in Biological Basis of Behavior with a minor in creative writing. Longitudinal Experience to Appreciate Patient Perspectives, or LEAPP (quite the acronym, no? ), is a program that aims to allow students to learn about what it is like to live with a chronic illness, and to introduce students to medical systems that provide care to patients with chronic diseases. Pairs of MS1s are matched with one patient (pediatric or adult) and stay in contact with the patient throughout their 1.5 preclinical years. Today, an MS1 shares his experiences so far with the program. On Thursday, an MS3 will be sharing how LEAPP has impacted her medical education. 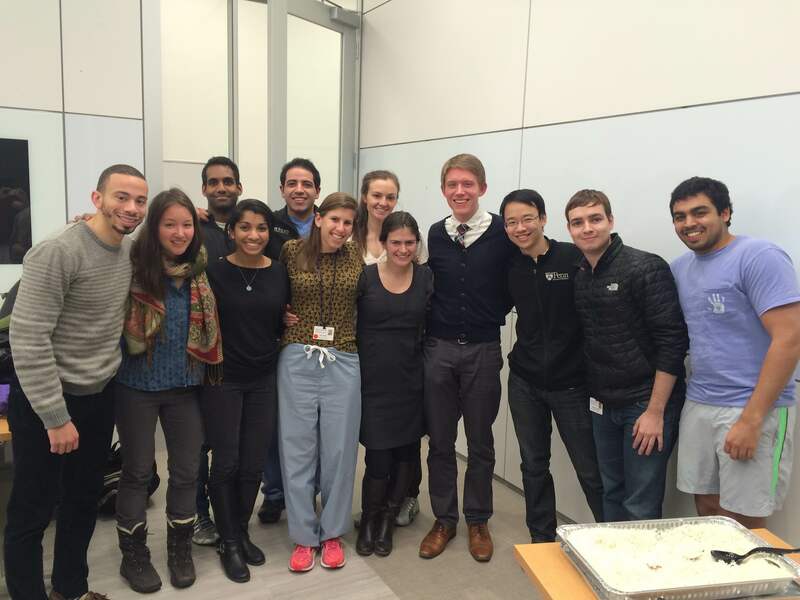 As I began my first year at Penn Med, I looked forward to the LEAPP program, although I wasn’t all that sure about what to expect. I knew I would have the opportunity to interact closely with a patient and their family during my first year and a half at Penn. Throughout that time I would have the chance to learn how different aspects of patients’ backgrounds and personal experiences shaped their care and personal approach to their illness. From the day we first met our LEAPP preceptor and pediatric patient, I quickly realized how fortunate we were to have this opportunity and how invaluable it would be. Our LEAPP preceptor carefully spoke with and selected families that he had the pleasure to work with during his career and that he believed would be open to this experience. They were willing to answer our questions and were genuinely kind and caring people. It was immediately evident how much our preceptor cared for his patients. At our LEAPP check-ins, he encouraged us to consider how our patient’s experiences and our own experiences influenced the provision of care. While it could be easy to get lost in all of the science we were studying the first semester, these experiences allowed us to maintain our perspective on what were equally, if not more, important lessons that would truly develop our ability to provide competent, exceptional care to our patients in the future, especially those facing chronic illnesses. Above all, the interaction my LEAPP partner and I have had with our patient and their family has been invaluable. We have not only been able to learn about our patient’s experience, but also how the family deals with their child’s chronic illness. We’ve witnessed how hard our patient works to overcome numerous obstacles and heard stories of how the parents went out of their way to provide their child with rich and diverse opportunities. They have expressed their gratitude towards the care our preceptor provided and have refused to succumb to the constant pressure and stress. Most importantly, they have generously given their time to answer our questions about how their personal beliefs and background influence their perception of their child’s illness and their interaction with medical system. After just one semester, the LEAPP program has already proven to be one of the most interesting, insightful and meaningful experiences I’ve had at Penn, and I look forward to learn even more from my LEAPP patient and preceptor. Chris Corbett is an MS1 from Cleveland, Ohio. He graduated from Williams College in 2013 where he majored in chemistry and math and then spent one year working at Boston Children’s Hospital before starting at Penn. Outside of class, Chris enjoys hiking, swimming, running along the Schuylkill River, and exploring Philly’s awesome restaurant scene.